The following is a review of Mission: Impossible – Fallout – Directed by Christopher McQuarrie. Theatrical Release Poster – Paramount Pictures, et al. The following is a retro review of Star Trek, a J. J. Abrams film. I cannot believe 2015 is coming to an end. It has been the most busy year for my blog yet, and I’m really excited to reveal my top ten films of 2015, some of which really surprised me, and others that somehow were better than expected. Originally, a couple of films looked missing on this list. This year’s list originally only featured 2015 films that were released in Denmark in 2015, and therefore films like the following 2015 films were not considered for the list: Tom McCarthy’s Spotlight, Quentin Tarantino’s The Hateful Eight, A. G. Iñarritu’s The Revenant, Danny Boyle’s Steve Jobs, Todd Haynes’ Carol, and Lenny Abrahamson’s Room. However, I reconsidered their status after having seen the films above. Spotlight, Brooklyn, and Steve Jobs have pushed The Gift, The Martian, and Beasts of No Nation off the top ten list. I also recently watched Yorgos Lanthimos’ The Lobster, and as a result it has dethroned both The Martian and Mission: Impossible – Rogue Nation as the single honorable mention. 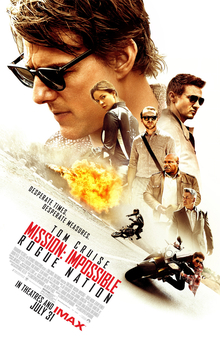 The following is a spoiler-free review of Mission: Impossible – Rogue Nation, directed by Christopher McQuarrie.